MASKerade: A Dingaling of a challenge! A Dingaling of a challenge! Over the Christmas break, my mom asked me to make some cards for her. She is the Director of a hand bell choir, and she wants some cards to sell at a symposium that is happening this year as well as some Christmas cards. Most bell images are not handbells. There are jingle bells and church bells, but I haven't found any handbells. 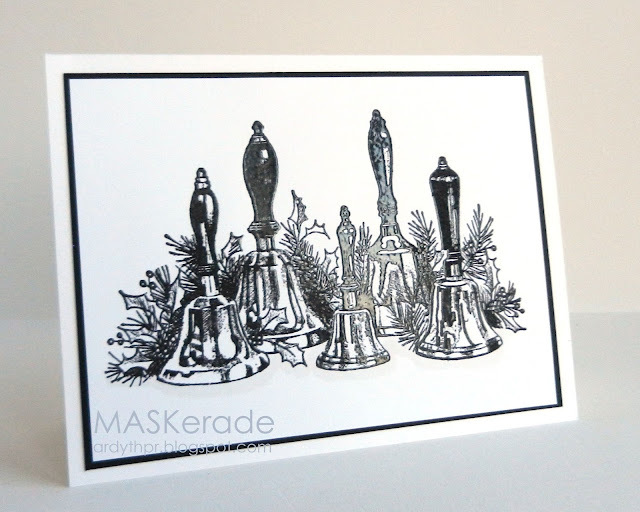 Until Kate and I found this Inkadinkado image in one of the local stamping stores (and even these are not the type of handbells that you'll find in a handbell choir). This image is not my style. At. All. But it is so appropriate for at least some of the cards my mom wants, that I bought it. And now comes the challenge. How the heck am I going to use it? This first image is an old fall back trick, Ardyth Adage #2 (see here for Adage #1) - stamp it in the middle of the card, and frame it. I added Burgundy Stickles on the berries, but I'm not sure if I like them. But of course there are other 'Ardyth Adages' for card making. A proverb or short statement expressing a general truth. 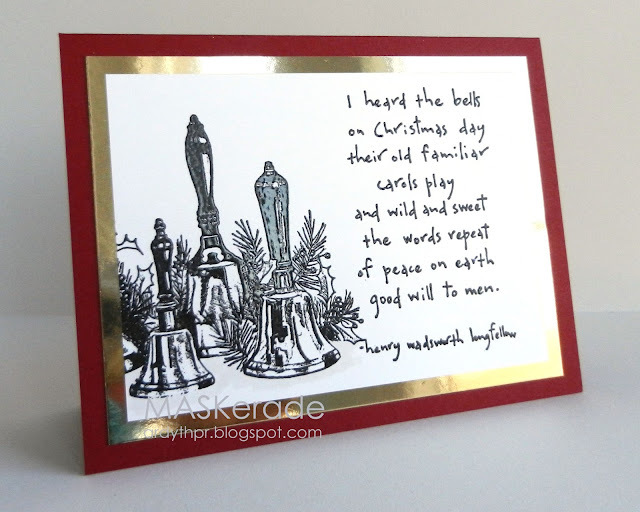 I stamped the image off the page on both sides, and added the sentiment stamp that I found at the same store. Once the black ink was dry, I used my Versamark pad direct to the paper and covered the panel in ink and then embossed with Iridescent. 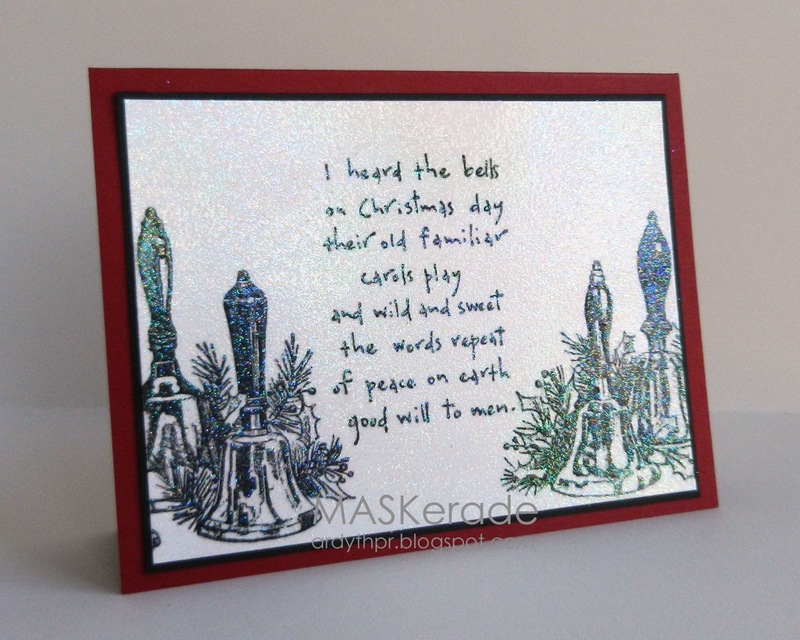 This is very sparkly and pretty in real life and I think it will be a pretty Christmas card. Adage Number #4 - Use Kaleidecolor ink and Adage #1, use a rainbow, are eluding me at the moment. What do you think - and maybe more importantly, what would you do with a stamp like this? I'd love to hear your ideas! Amazing cards and wit...what a lovely combination. My votes, Mirror and the Silver looking background! Cool stuff! Wow, can't believe the different looks you managed to create with that non Ardyth stamp! or the over stamped one. I like everything you did with this stamp! I think my favorite is the overstamping, but I also really love the image stamped off the page a lot, too. Other than some simple watercoloring, I can't think of anything that would work for sure. Maybe emboss the entire image in gold or silver on a dark background? I think your Mom will love all of these cards! Ardyth, you are seriously amazing! Wow! First of all, it is unlikely I would buy a stamp like this, because I would have zero ideas of what to do with it. But now that I've seen the MANY variations possible, I just might consider it next time! I love it. I love bells, and one day plan to buy myself a set - I play them in whichever shop I find them in at the moment (checking they are actually in tune and sound nice), entertaining whoever happens to be present at the time, LOL! Re ideas for what to do next: I really like what Karen on her 'Snippets' blog has done with some vintage-y images lately, ie stamped the image and then stamped and coloured a small square section to pop up over the top. Anyway, I really admire what you have already done with what I think for most stampers would be a less than straightforward image for a CAS stamper. Wow...love the variety of how you stretched the stamp but the irisdecent (I know I spelled that wrong!) is incredible!! What would I do with a stamp like this? Not much!! 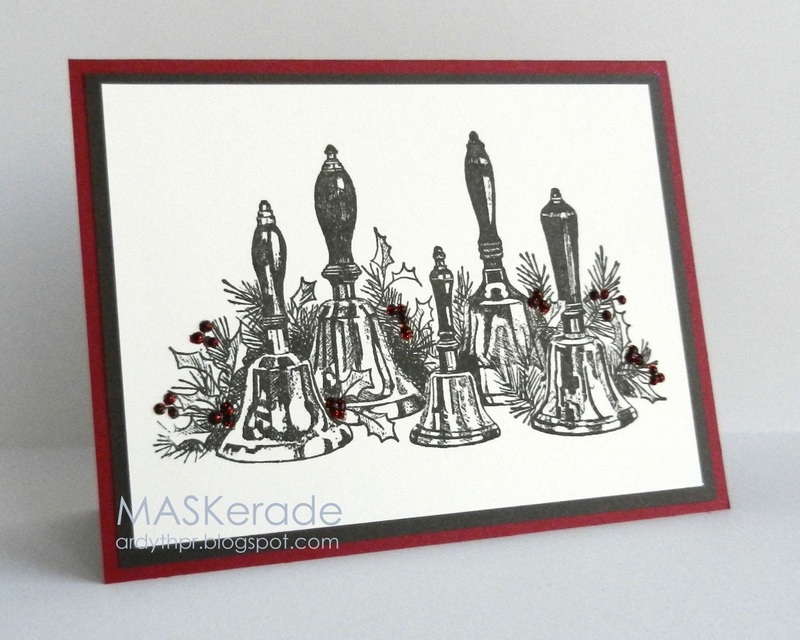 I think your cards are fabulous - I really like the one with the berries glittered, and the overstamped card. You really are amazing - I don't think I could have come up with such variety. Great work! Hmmm... I think you've covered all the tricks for a stamp like this. Not my style either but you've managed to rock it! Maybe use some kind of window or mosaic style to break up the image? I think you knocked it out of the park considering it is not a stamp that is your style. My adage is "when in doubt use kraft paper" - I think this would look lovely on kraft or confetti cream in a deep red or burgundy ink. I hate to color and when I do this, find it isn't necessary. Only you could take a disadvantage and turn it into an advantage. I think your mom is one lucky person! Every single one of these cards is amazing! Beautiful! You have done an amazing job with these cards. I can't imagine that it was an easy task to put your heart into this when it isn't you style of stamp! So impressive. My fav of the these is the one with the burgandy stickles - love the richness of the color. Only other idea I could think of would be to change the orientation of the card, stamping off part of the image but leaving the handle of the tallest bell along the long edge of the card, possibly leaving more white space. 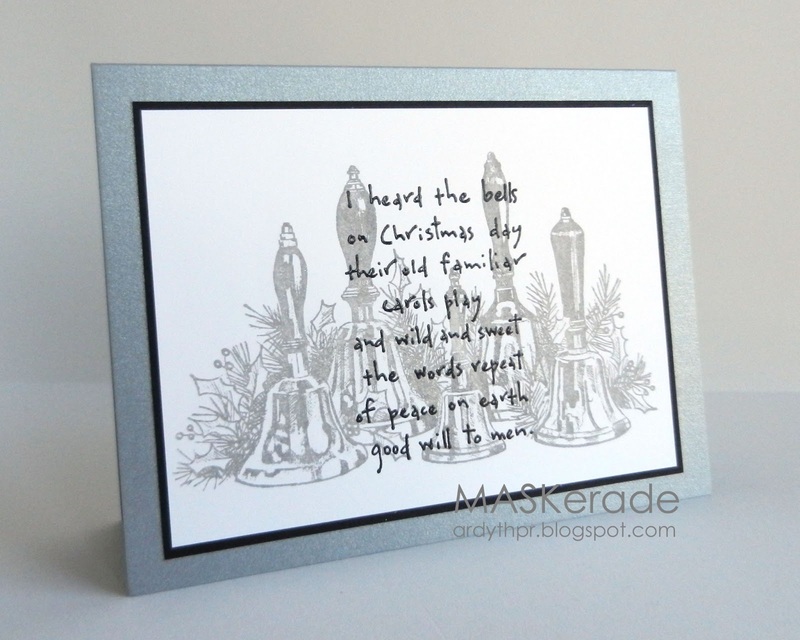 All great cards Ardyth, those bells are very cool for your Mom's card and yes not your style but you still rocked them! Ardyth, you did an amazing job coming up with ideas for the stamp, I like the stamp-very pretty. I might have to think uses but like the overstamp-I think it's the words that set the bells off- I know you Mom is proud of all the designs! You are seriously creative with all the uses for this pretty stamp! If it were me, I'd stick with card design #2, but I'd add some green color to the leaves, and a touch of gold to the bells. I really like it just the way it is though - it's a very pretty image all on it's own! Can't add any suggestions but I'm impressed with all the options you came up with (I wouldn't have thought to stamp off the edge on both sides), and I love the going grey/overstamped version. You mentioned to me some time ago about these cards and I had no idea what you could do. I guess you didn't need my ideas (if I'd had any). Is there any way to emboss the bell portion with gold, like the actual bells? I don't do masking so have no idea how difficult that is, but you're so clever you can probably figure it out. Would love to see what you can do with that but I love what you've done so far. Here you go again with another challenge that I think should be a broader one ... use a stamp that is totally NOT your style (which might be difficult if you're a great shopper, but there are probably some purchases that seemed good at the time but have never seen a drop of ink since, especially if you've been stamping for awhile). I have to say, you've done very well with these! My favorite is the monocromatic overstamping at the end. And I laughed when I read your Adage #4 on Kaleidecolor Ink, because in the back of my head I was wondering if that was going to come out. Other ideas? Maybe fussy cut the left one out. You could do a brown/black handle, have the bell in gold foil, and put a sentiment underneath. I think that would look like an Ardyth card. This may not be in your comfort zone, Ardyth, but you have done an amazing job with these 2 stamps. So many different looks that most people wouldn't even realize that they all used the same stamp! An amazing job! Your Mother is going to love them!